Heart Saver CPR - Emergency Medical Training Professionals, Inc. The HeartSaver CPR course is designed to provide a wide variety of individuals the ability to recognize and assist in life-threatening emergencies. 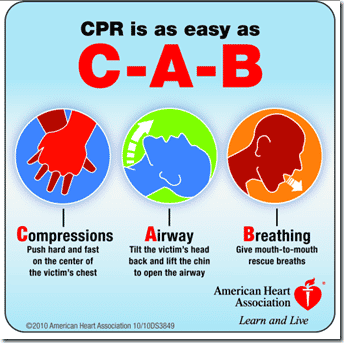 This course is classroom based and teaches the basic CPR skills. These skills include performing a head tilt-chin lift, giving compressions and breaths and contacting other EMS providers. The HeartSaver CPR course focuses on Adult and Child CPR and choking. It is designed to provide a variety of individuals the ability to identify and help perform life saving measures in a safe, timely and effective manner. During the course, an American Heart Association Instructor conducts video-based lessons and works with students to complete their CPR skills practice and skills testing. HeartSaver CPR is for anyone who wants the knowledge to try to save a life when the need arises. The course also provides employee training for designated first responders and individuals needing credentialed training for job or regulatory requirements. The American Heart Association HeartSaver CPR Course Completion Card is valid for two years.